Twelve of Australia’s best writers from the queer community are brought together in this groundbreaking collection of YA short stories. 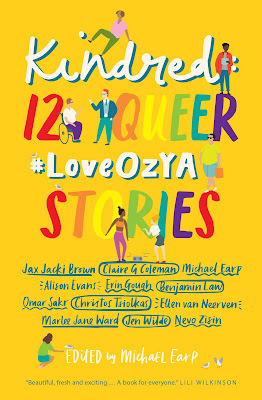 In this powerful #LoveOzYA collection, twelve of Australia’s finest queer writers explore the stories of family, friends, lovers and strangers. The connections that form us. This inclusive and intersectional #OwnVoices anthology for teen readers features work from writers of diverse genders, sexualities and identities, including writers who identify as First Nations, people of colour or disabled. 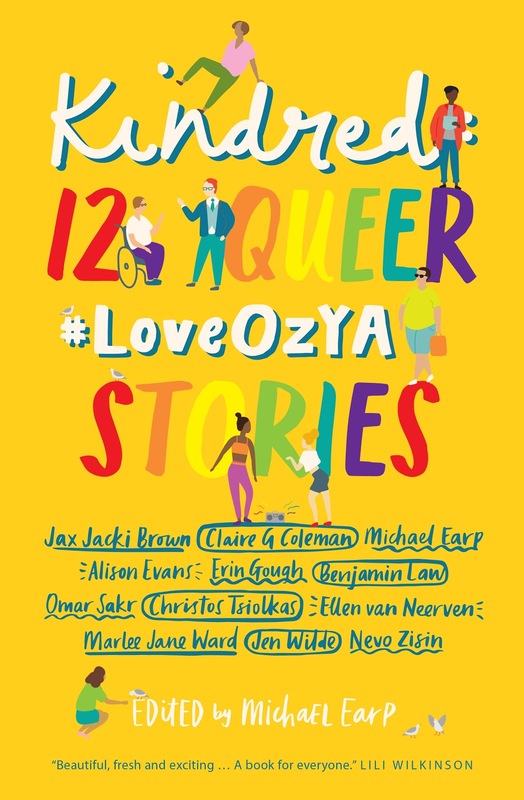 Includes a foreword by anthology editor Michael Earp, resources for queer teens, contributor bios and information about the #LoveOZYA movement. He's a champion for Australian young adult literature, a bookseller extraordinaire, an author, an editor and he can rock a pair of overalls like nobodies business. 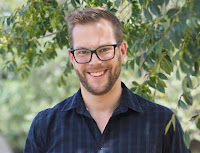 I had the pleasure of talking to the always wonderful Michael Earp about the upcoming release of Kindred: 12 Queer #LoveOZYA Stories. I wanted to begin by asking how the concept of Kindred begun and how you were able to curate what is a landmark release for young adult literature in Australia. The idea for Kindred was spawned at the launch of Begin, End, Begin: A #LoveOzYA Anthology. Danielle Binks had previously been the Chair of the #LoveOZYA committee and at that time, I was the Chair and so I had lots of people asking me if I would be editing the next anthology. This is not at all how it works. Being Chair did not mean we automatically edited an anthology, Danielle had worked tirelessly outside of her role as Chair to usher Begin, End, Begin into the world. And so while there wasn’t a justifiable correlation, I started to think, maybe I could edit an anthology. But, if I did, I’d want it to be a dedicated queer anthology. Because, let’s face it, I spend most of my time daydreaming about how to make my own world a little bit gayer… It’s only natural. However, Kindred isn’t the first dedicated queer anthology for young adults published in Australia. There were actually two published in the nineties, Hide and Seek edited by Jenny Pausacker, and Ready or Not edited by Mark Macleod which, unfortunately, are out of print. I was privileged to be able to read Hide and Seek and it holds some wonderful stories in it. But to be able to work on this project has been an amazing experience and I’m so thrilled I’m able to offer contemporary readers something. Because I really do feel like it’s time that such a celebration of queer authors and queer Australian YA be out there in the world. Could you tell us a little about the story you contributed to the anthology? My own story in the anthology is a fantasy called Bitter Draught. I don’t want to say too much about it, other than I knew I wanted to write a gender non-binary witch, and I was going through a rough patch personally when I wrote it. Don’t at me. The anthology features various genders, identities and sexualities and also includes Indigenous authors, authors of colour or disability. How important is it for adolescents to see themselves reflected on the pages of Kindred? When I was working out who to approach to write for Kindred with my editor, Nicola Santilli, we knew we wanted it to reflect the diversity of the Australian people. After all, it’s supposed to be a snapshot of who we are and what we’re thinking about at this point in time, having as many identities represented as possible was incredibly important to us. When you’re dealing with a minority that is as broad as the queer community, intersectionality is bound to come into play. And try as we did, there are still many identities that aren’t represented. (we only had twelve places!) But I’d love to hear from Aro / Ace and Intersex authors next time! I believe that whether we were conscious of it or not, we all look for ourselves when we read, especially as teenagers. And what a happy thing to discover a reflection of yourself in the pages of a book! What messages do you hope readers take away from Kindred? Above all else, I hope that Kindred is just a thoroughly enjoyable read. As for other takeaways? That there is hope, regardless of what you’re currently facing. I don’t want to sound too schmaltzy, but I’m still learning that now. What’s going on right now is not for always, and there’s always joy to chase around the corner, and hold onto while you can. But you have to turn the page to find out. Walker Books Australia, together with Michael Earp and the #AusYABloggers are celebrating the release of the Kindred: 12 Queer #LoveOzYA Stories anthology. This is an own voices tour and open to bloggers, reviewers, Instagrammers and Youtubers from Australia and New Zealand and will begin on the 1st of June and run until the 10th June 2019. Simply fill out the form found here. Michael Earp is a book obsessed author with a love of children’s and young literature. He's read it, sold it, blogged about it, studied it and written it. He's the editor of Kindred: 12 Queer #LoveOzYA Stories which will be released in June 2019 by Walker Books Australia. He is also a contributor to Underdog: #LoveOzYA Short Stories which is out now through Black Inc Books. I love that Australian teens will have their own lives reflected in this anthology. Me too Shelleyrae, it feels as though it's been a long time coming and I hope the wider reading community get behind the anthology, we need more representative books for teens and sales will reflect how popular diversity in our young adult literature is. This anthology sounds fantastic. I love that it's so diverse in the stories - and the authors included -and not JUST in terms of sexuality. Thanks for the fab interview, Kelly! Love the title too: Kindred. So good! I'm really looking forward to release Lauren and for international readers, it should be available on The Book Depository as well. Young adult diverse anthologies are incredibly popular in Australia, we've had wonderful collections from Indigenous authors, authors with a disability, Muslim authors, migrant authors from an asylum seeking background, queer authors and soon African Australian authors as well. Make sure you follow the blog tour the Australian Bloggers Group are planning during June, it's a queer only tour so you'll be able to discover lots of wonderful new blogs! Interesting! I love the concept for this book! Thanks for bringing it to my attention. I love how much you support this. I see you posting about it all the time, and supporting different groups and authors. You rock, girl! Thank you my darling. One of my biggest passions is supporting Australian young adult authors and trying to share them with the world, or at least my little corner of the internet. Being part of the bloggers group in Australia, we've been so privileged to be able to host tours for so many wonderful books and this one is indeed special. We feel honoured to be part of the celebrations and also to place publisher copies in the hands of queer reviewers throughout Australia and New Zealand. It's really an honour. I don't normally read much in the way of anthologies, but this one sounds brilliant! Doesn't it just Suzanne! I can't wait to pick myself up a copy upon release. What a gem this is, Kelly -- and I would have missed it without your heads up!